I am always delighted when someone truly “clicks” with me. Such has been the case with Marie Marshall, one of the most impressive wordsmiths whom I have become acquainted with through Allpoetry.com, a literary ocean in which plenty of genuine talent abounds. (Thanks to Jeff Green, one of my earliest certain contributors to the forthcoming anthology, A Fancy of Formalities, for introducing me to Marie. She has been a linchpin in netting talented poets and pulling them my way to make this anthology the most impressive formal collection of 2012, imho)! 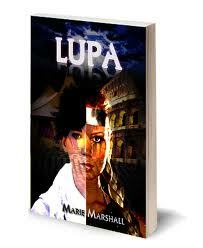 Furthermore, Marie is a bright and sparkling go-getter with a positive attitude that certainly contributed to her recent contract with P’Kaboo Publishers for her novel, Lupa. I look forward to reading it and know that Lupa will find itself in many hands, enthralling minds and captivating hearts with her poignant delivery.